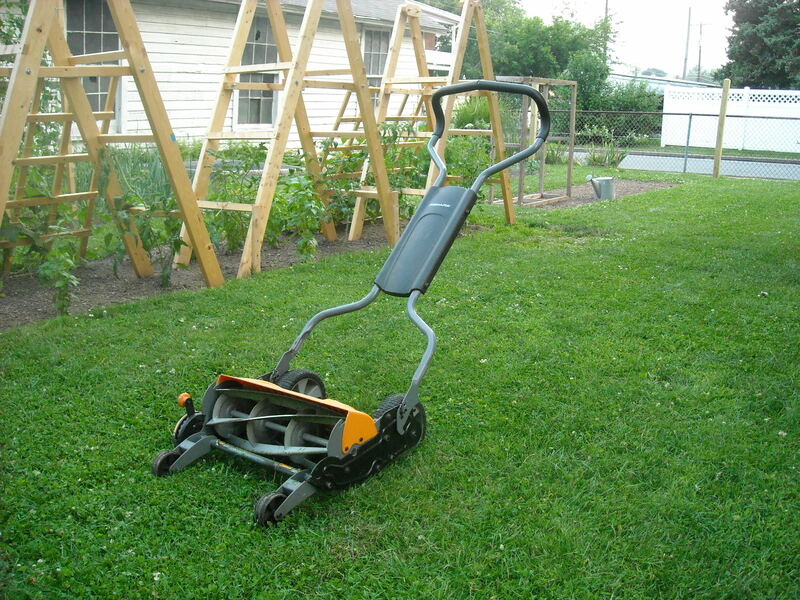 The Fiskars Momentum™ mower is a well-engineered machine. It is very easy to use and very quiet, it makes mowing a peaceful experience. According to the Fiskars website, the reason that it cuts with such ease is because it has an Inertia-Drive™ Reel, which delivers twice the cutting power of a standard reel mower. There is also a cutting height adjustment lever on the side to change the cutting height of the blades (1″-4″ grass height), this is a really nice feature. The overall cutting width is 18 inches. The best feature of this mower is that it does not use any gas. 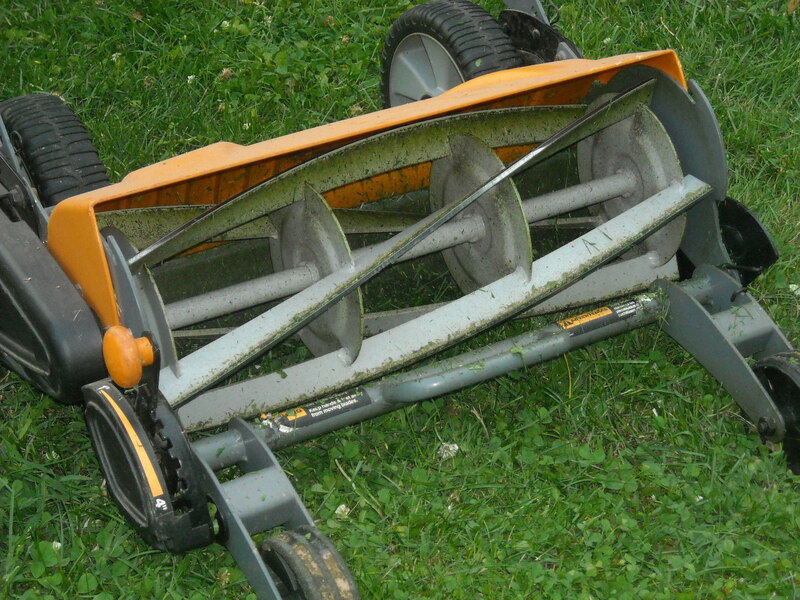 As you can see in the images the wheels sit inside, and the blades extend out to the edge of the mower. This allows you to mow right up to the edge of your flower beds or fence lines. While this function works well, there are several areas around my yard that I still need to use my weed wacker to trim. Sometimes it does take a little longer to mow with it because of people stopping and asking questions about it. The mower really turns heads. Fiskars even offers a bagger option for this mower that is sold separately. I have the bagger and it works great. It is the perfect option if you do not like having grass trimming in your yard. It does make mowing a little more challenging, because it adds to the overall length of the mower. There are two challenges when mowing with this mower. First is it does not do well with really long grass or long weeds. If you keep after your yard it should not be a problem. The second challenge is how you mow. Since this mower only cuts when it is moving forward, the key to easy mowing is to have a mowing path with the least amount of stops. I usually mow the perimeter of the area first, then the inside of the area. It’s a little hard to describe but once you use the mower you will understand. Fiskar has done a great job developing this mower. Having mowed with this mower for over a year I am still very happy with it. It’s perfect for a small yard. Disclosure: I am not an employee of Fiskars and in no way affiliated with Fiskars. 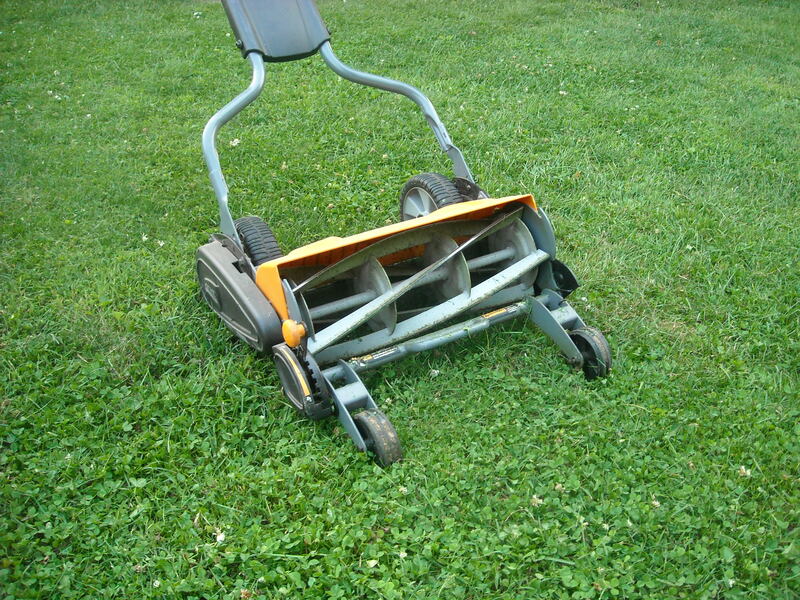 Click here to link to the Fiskars Mower site. This entry was posted in General and tagged Backyard gardening, gardening, Green Living, Homesteading, Lawn Care, Organic gardening, Urban Gardening by M Riland. Bookmark the permalink. Hi, I just found your blog and wanted to ask a question about your tomato ladders. Are those permanent in your bed or do you plan to take them in during the winter? I’ve had the same trouble with cages and vowed to find a new solution for next year! I am glad you found us, the tomato ladders are temporary. By removing a few bolts the ladders will simply fold up for easy winter storage. The cucumber trellis is separate and can also be easily removed. Let me know if you have any additional questions.